The above info came from Charlotte Lesley, and was edited by yours truly (contact me). The image came from www.madhousemedia.com.au. Tasuke Shichiri lives on his own because his parents are always traveling. One day his father sends him a strange ring he found in China. It is called the Shitenrin and it is said that when someone with a pure heart looks into the ring they can summon a great spirit of the moon who will protect them. This is just what happens to Tasuke. That spirit is Shugogetten Shaorin, or Shoa for short. She has been in the ring for 4000 years, so she isn't really that familiar with the modern world. She causes more problem for Tasuke then she protects him. The next day Tasuke gets a wand from his father. It is also from China, from the same location as the Shitenrin. Tasuke (accidentally) summons the goddess Keikounitten Ruuan. Her duty is to see her master happy. Shao and Ruuan are long time rivals, which doesn't make it better for Tasuke. 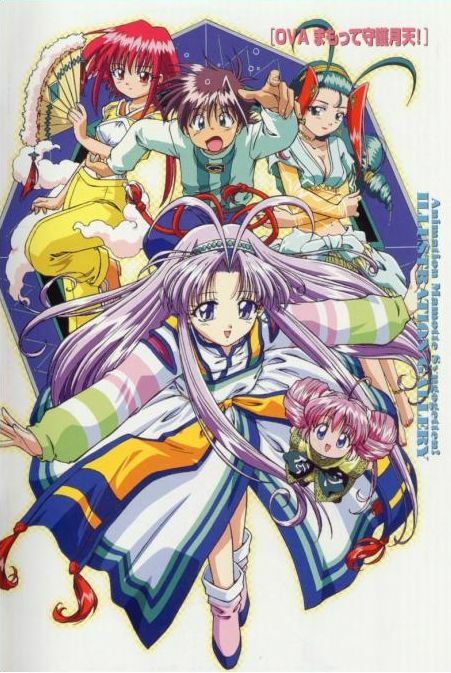 Shao can call Hoshigamis (literally "Star Gods") from the Shitenrin to help her, and Ruuan can, with the Keikounitten, bring inanimate objects to life. The above description came from Charlotte Lesley, and was edited by yours truly (contact me).